Life is not perfect by any means. If it were, there’d be no challenge to it. We all have our moments of personal joy and tragedy. Whether it’s family, money, or job related issues, we all have our problems, big and small. One thing I never did was to share my personal problems with others at the office. I think some people made this a hobby. Not me. Two reasons: First, it was none of their business, and second, the office was a place to work, not waste time gossiping. Keep your problems to yourself. Steer clear of negative people they’re losers. Only spend time with positive people who can give you a boost up the mountain, not drag you down into the pits where losers live. Having a positive attitude is important in your home too. You have the opportunity to shape the way others see you. Whether it’s your spouse or your kids, they all see you as a model to follow. What kind of example are you setting? What happens to the atmosphere in your home the minute you walk through the front door? Make it a positive one that can help build a healthy and loving atmosphere for your family so that they will respond with the same positive pride in having you as a special part of their lives. Unfortunately I wasn’t able to enjoy that kind of experience in my home growing up. That’s probably why I am so aware of its importance and what it can do to a family both positively and negatively. The good news here is that YOUR ATTITUDE PLAYS A KEY ROLE IN MAKING THAT DECISION. You control that every step of the way. 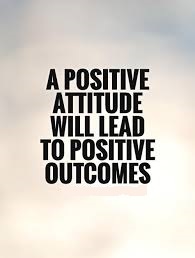 Never leave your home for work without taking a positive attitude with you each and everyday. Inside each of us, there is a voice that creates the urge and desire to succeed, to push, to exert ourselves to go on, even in the face of adversity, until we achieve our goals. A positive attitude always listens to that voice. If you’re waiting for someone to make the world just right for you so you can succeed, you’re on the road to nowhere. Living a successful life is about coping with and continuously perfecting how you go about dealing with adversity. The most important reason for having a positive attitude is not to get you through the good times, when everything seems to be falling in place for you. It’s to get you through the tough times, the stormy seas, when you really need to hunker down; the times when attitude can make the difference, especially when difficult decisions have to be made. “So how do I get a positive attitude, Joe?” you ask. “I’ve got nothing to be happy about or proud of even my family has doubts about me.” The most difficult thing you will have to do in order to adopt a new positive attitude is to break the shackles of the past that are holding you back. Forget who you were. That’s not where your future is. You don’t have to be where you started from for the rest of your life. You are not bound to follow in the footsteps of all the losers you ever hung around with or abide by all the bad decisions you ever made. If that were the case, I would be sleeping in some dark alley somewhere. Take control of your fate! Once you do that and you make peace with yourself move forward. Transform yourself into a positive minded person who will stop at nothing to become a more complete person both on the job and at home. You must believe in yourself! If you do, you will be successful. There were many times I could have just said, “I quit. I’ve had enough,” and walked away from it all like so many people do. Instead, I hung in there, stayed positive, and put in a little extra effort. It made all the difference in the world. The reward that follows will almost always be equal to the amount of effort you put into maintaining a positive attitude along the way.